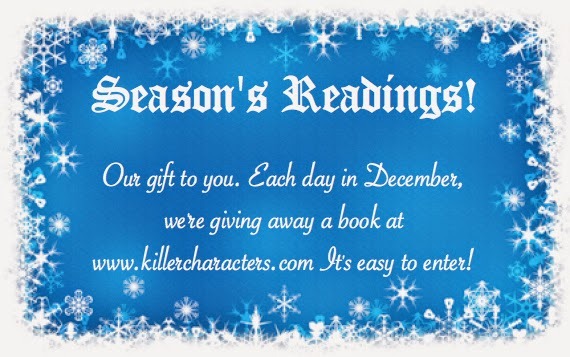 Happy New Year to all of our readers from all of us at Killer Characters! How do you plan to celebrate New Year's eve? 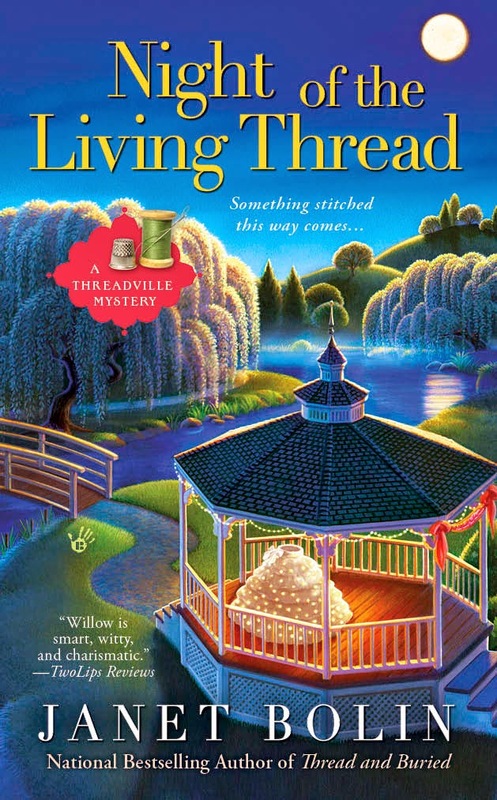 One lucky commenter will receive a copy of NIGHT OF THE LIVING THREAD by Janet Bolin. Today's draw is open to addresses in the U.S. and Canada. No big plans for me. I'll be at work until 10pm. Happy New Year!!! Watch a couple more Christmas movies with hubby one more time this year, have some special snacks, eat 12 grapes for luck as the clock strikes 12. No plans....my husband and I stay home and watch tv. Happy New Year! We'll make a small feast, watch some TV, and then go outside at midnight to see the neighborhood fireworks! I am staying home with family and having some special foods to celebrate. We'll be doing a little bit more packing up and moving and then just a quiet night at home. Happy New Year! It's very cold here, planning on staying home and making a big pot of chili! I'm not doing anything. Not sure if I'll watch the ball drop on tv or not. Happy New Year! We'll probably stay in tonight and watch TV. Happy New Year!!!! Going to enjoy a bottle of wine, a good book, and watch the ball drop!!!!! Seafood dinner and probably a Supernatural marathon. No real big plans here, we usually just watch movies to close to midnight then switch over and watch the ball drop and then go to bed. We will have seafood and kielbasa!! Happy New Year to you!! First off we will go to church. Then we will gather at someone's house to celebrate with snack foods and fun and games. I'm going to try to get set up on Netflix today so we can watch a movie tonight. Wish me luck. For the first time in a long time, my husband and I won't be at home--we're going to friends' house, playing bingo, and eating leftover Christmas goodies. :) We will probably not be out late, as he is on call for work tomorrow. I'll probably be at home on the computer and watching the ball drop on TV. Either that or playing games with my mom. Nothing very exciting. Sitting by the fire reading a book. A quiet evening at home - probably asleep before midnight. No where near the roads and crazy drivers! Quietly at home with my honey. Tomorrow we feast! May the New Year be prosperous & healthy. Will read to cats to distract them from festivities on river. @Sue Farrell...gee, I thought you'd be home tonight building a bigger mailbox to fit all of those books you've been winning! Congrats girl! We'll just be staying in and probably be reading when the ball drops. Happy New Year Everyone! Happy New Year everyone, I'm celebrating at home, curled up with a good book. Watching New Year's shows, eating a party tray with ham, cheese, & crackers, and drinking grape punch. I'll be watching the New Year's Eve shows, probably the new one with Hoda and Kathie Lee. Chinese take out and movies! PERFECT! I got home from work in got into my lounge wear. I had chicken wings and champagne for dinner and am ready for bed. I think I'll take a nap so that I can be awake to usher in the new year with more champagne. I'm just snacking, drinking and cuddling with my furkids. A perfect night! A nice quiet evening at home. We're having a quiet night at home - appetizers and movies. My hubby broke his ankle two nights ago, while teaching our daughter to ice skate. So, we skipped the kid friendly party that we were invited to, and are enjoying a fun family night. Fireworks been going on in the neighborhood for hours and will until after 2015 arrives. So up doing a few chores and then to bed after midnight. Happy New Year to all!! My hubby and I are home with some good movies, without kids to out-vote us! Wine and cheese and chocolate by the fire complete our perfect relaxing evening. No big plans. Now home from our daughter's in OKC where we spent our week of vacation. Watching John Wayne in El Dorado; hubby eating a burrito. We'LLC stay up to see the new year in (another 2 hours) and then go to bed. Will watch the ball drop on T.V. Waiting to see if the hubby can stay awake. First time in my life will not have black eyed peas on New Years eve. Happy New Years. Happy New Year! We have a tradition of staying home and relaxing. Having strawberry cheescake when it turns 2015! Our Lions club got together for pizza, wings, BYOB. Nice and low key. Did nothing special last night but tonight, New Year's Day, we took our daughter and her family out to celebrate the New Year without all of the masses of people bringing in the New Year. It was wonderful and far more relaxing too. Last night we read, and had a slice of cheesecake after dinner. Us old folks sure know how to party now, don't we? ?